This .223 Remington ammunition from Wolf, an American importer, is manufactured in Taiwan using the same equipment and components utilized to make their 5.56mm NATO rounds; those cartridges have been purchased by the Department of Defense and utilized to support U.S. warfighting efforts for the past decade. These particular cartridges use 55-grain full metal jacket (FMJ) bullets which are great target work, zeroing, and plinking. The .223 load parameters make these rounds safe for nearly every chamber spec of AR-15, Ruger Mini-14, or any appropriately chambered bolt-action sporting rifle. These cartridges also use non-corrosive Boxer primers which are accompanied with moisture-blocking sealant when they are affixed to their reloadable brass casings. Each cases crimp point rests on the toothed cannelure of its bullet in order to resist dislodgement under recoil and preserve accuracy as well as safe operation. The 55-grain load is common to the .223 caliber and offers manageable recoil while matching the ballistics of many popular loads for varmint hunting and practice. 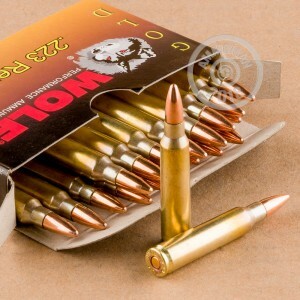 Purchase this case of ammo or any other items totaling $99 or more to qualify for FREE shipping direct from AmmoMan.com's warehouse to your doorstep! An accurate, clean round at a great price! Once again Eric and the guys at Ammoman come through. This is my fourth case of Wolf Gold. Chambers well, is very accurate and clean. Was shooting Tullamo because of price but that stuff feeds and extracts roughly. Will stick with the Wolf Gold. Great round at a great price. Bought three cases from Ammoman last week. Fired 350 rounds. Clean and reliable! Been dealing with Eric and the crew at Ammoman for years! Fast delivery expert knowledge! Reliable, 100 yard range ammo. Haven't tried grouping beyond that. 2k rounds and ordering more. Great Ammo ,Great Price !!! I've ran over 3,000 rounds through a Ruger AR556 and have had zero issues. Good range ammo at a reasonable price. Good for target shooting. No so, if you reload. 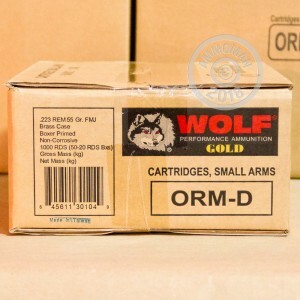 The Wolf Gold are excellent ammo. No misfire. No jams. Pretty good grouping from 100 yards. 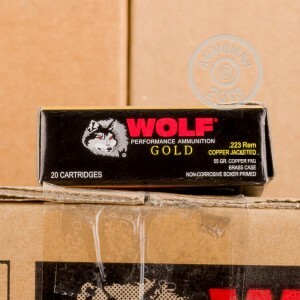 However, if you like to reload I would not recommend Wolf Gold. After sizing 700 cases I had 119 that would not size properly. Out of the 119, 106 were Wolf Gold and 13 misc (PPU, LC). Otherwise, good ammo. About every 10 round (average) the rim on the case were it is in contact with the claw on the extractor is being ripped off, yep, a average of 3 cases per mag needing to be cleared with a rod to push the case out... and before you blame the rifles, Daniel Defense, A Spikes Tactile and is police/military only early production Bushmaster... it is happening in ALL of them... its the cases the case rims are so thin its stupid, the extractors are literally just pulling right though them, these have the thinnest I have ever seen. have shot couple of hundred rounds of this in AR & Tavor, w/o any hangups. I shot 400 rounds so far and it has been awesome. Fast shipping too. I ordered ammo from a different site and it took forever to receive. I'll only buy from this site from now on. Have shot about 200 of the thousand, no miss fires, or rounds jamming. Received ammo in the shortest possible time,. Package in good condition. Function just as it should. Relatively clean burning. Allowed on the indoor ranges. Shoots clean, straight and reasonably priced. Great Stuff from the shores of the southern pacific, no its not a Kia? Its Ammo Fool listen up now! cheap, clean and accurate what more could you ask for, oh free shipping too!!!! Put 800 thru an Colt AR, No misfires, No issues. wanted it fast and got it quick! Fastest shipping and great price. The package was setting on my porch in 2 days. I am hooked! Price was great and free shipping tops it off. Great ammo for price and reliability. I shot 400-500 rounds through my Full Auto Oylimpic Arms 11.5" Colt Commando Upper with MagPull Magazines and NOT a single failure to feed, fire, extract or jam. My Full Auto AK Norinco with TulAmmo did jam however to my disappointment on as many rounds. Hurt my pride as I am an AK fan through and through. From all rounds I tested the best group in my 18" IMI TAVOR! Easy order, Fast delivery. Great job ammoman! I haven't had any problems with this ammo ... never a jam ... true to the target.